How does 'Homemade Tomato Basil Sauce' sound? I know it sounds great, but we have a perception that we can get it from the store without much hassle, why bother making it. I also felt the same way until I started making my own tomato sauce. 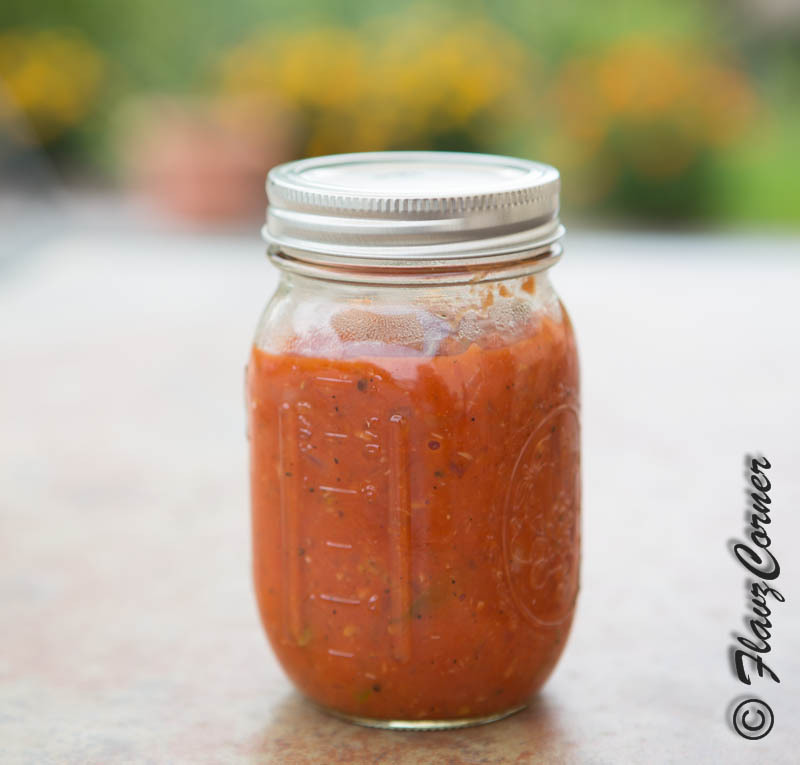 It's always good to have some homemade sauce handy, which is free from any additives and preservatives. I have a small garden in my backyard and I got lots of tomatoes last year from there. I was lazy to make sauce, but I managed to chop them and freeze it. It came handy one day when it was snowing really bad and kids asked for spaghetti for dinner. I was reluctant to go out in the snow and buy the sauce, so I ended up making my own. So this year I thought to plant more tomatoes and make the sauce ahead and freeze it, and guess what I made a mistake of planting them in containers and they didn't yield much. So I ended up buying tomatoes this year :(. Below is the picture of tomatoes from last year. I used the ripe tomatoes on vine for this sauce. It is really easy, you just have to put everything into a pot, set a timer, go do your stuff and come back and just blend the sauce and store it in sterilized bottle. I am sure you want to give it a try now, right? You can use this sauce for pasta dishes and pizzas. Take some ice cold water in a big pot and keep it aside. 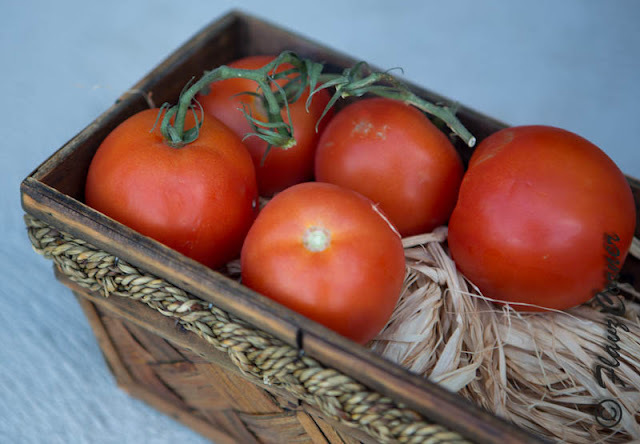 Bring a big pot of water to boil and put the tomatoes carefully into the pot and leave it in there for 2 minutes. Take them out and plunge them into the ice water and leave it for 5 minutes. Gently pull the skin of the tomatoes and cut each of them into 4 pieces. Take a heavy bottom pan and cook the garlic till slightly brown in olive oil. Add the onions and cook for 2 minutes with salt and pepper. Place the chopped tomatoes and 3/4th of the chopped basil into the pot and cook it covered on low heat for 30 minutes. 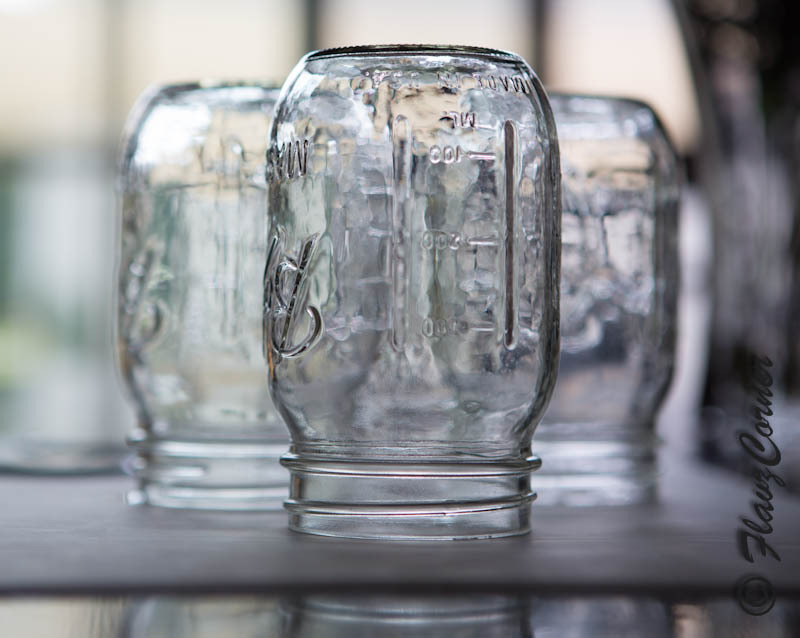 While the sauce is cooking bring a large pot of water to boil and carefully immerse the mason jars and their lids in the hot water. Make sure that you don't put the plastic coated lid into the water. Let it stay there for 5 minutes and boil. Turn of the stove and let the water cool till you can transfer it to a clean surface and dry it completely. After 30 minutes of cooking the sauce, turn off the stove and let it cool down. Transfer the sauce into a food processor or blender and blend it for 1 minute and place it back into the pot. Add the tomato paste and rest of the basil and cook till it starts to bubble. Ladle the warm sauce into sterilized jars and store them in the refrigerator. 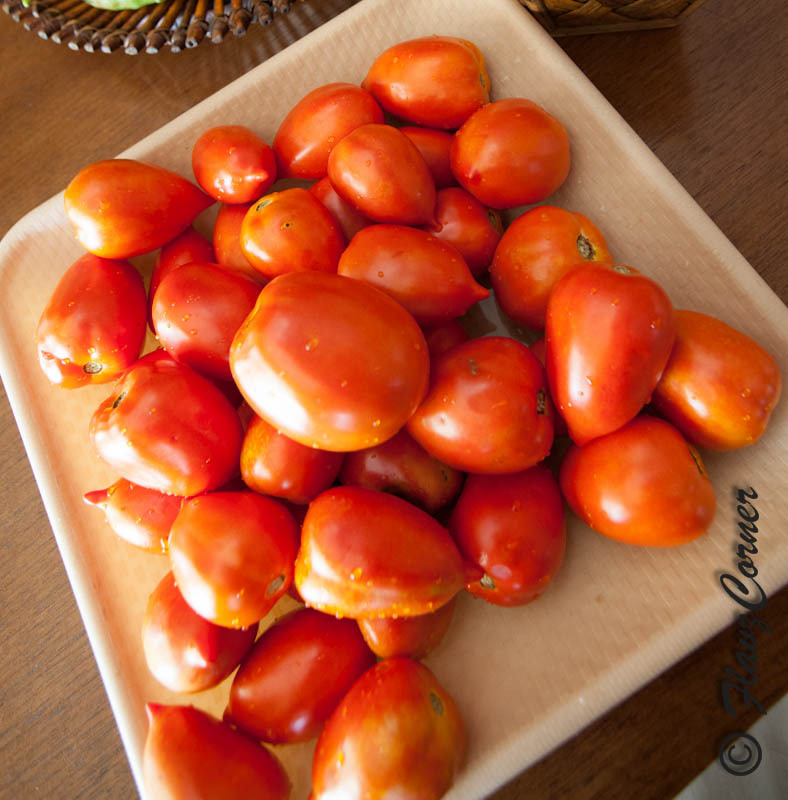 There is no need to blanch the tomatoes if you have a good blender or food processor. Cooking the tomatoes with the skin gives the nice red color to the sauce. Just make sure that you puree the thick sauce well. I prefer not to remove the skin. You can use any tomatoes those have more flesh. If you want your sauce to be chunky, reserve few ladles of cooked tomato sauce before blending and add them back into the blended sauce. The sauce will remain good for one week in the refrigerator. If you are not planning to use it right away, just freeze it. Sure Sherryl,try it and let me know. i love to add some homemade sun dried tomato too to the recipe to gie a kickin tangy flavour! Here you'll find healthy and delicious recipes that uses mostly fresh ingredients, tastes great, and are easy to prepare . There is a hidden Cook in everyone, come explore and experiment with me!!!! Flavz Corner (text and photographs) are copyright 2012 by Shibi Thomas. All rights reserved. Theme images by A330Pilot. Powered by Blogger.